Blog — Kristin Schnurr, N.D.
Flipping through our well thumbed clinic copy of The Whole Foods Nutrition cookbook we were struck by the idea of Miso soup for breakfast. It seemed so odd, so out of place, and yet so completely perfect. A traditional Japanese breakfast, miso soup is cleansing, light, nourishing, and filled with beneficial bacteria. It stimulates your digestive system and is easily absorbed by your body. You will feel energized as you move through your day and your digestion will be grateful for the chance to rest and recharge in this month of darkness and renewal. Because mornings can be a tough time to think about cooking we have structured the recipe so that you prep everything at the beginning of the week and then finish each bowl in the morning when you warm it up. Heat the toasted sesame oil in a 3-quart pot over medium heat. (If you use coconut oil you will lose the rich depth of flavour that sesame oil brings). Add the carrots, mushrooms, garlic and ginger and sauté for 2-3 minutes, being careful not to brown the vegetables. Add the water and wakame seaweed and bring to a simmer. Cover the pot and cook for 7-10 minutes, or until the vegetables are tender. At this point you can continue with one large batch if you will be serving 4, or continue as instructed for individual bowls of morning miso. For a large batch: turn off the heat and add the bok choy, green onions and miso that has been mixed with a little water. Then add 1-2 tablespoons of tamari, 1 tablespoon of vinegar of your choice and 2-3 teaspoons of hot pepper sesame oil (or chilli flakes to taste). For individual bowls: Put your sliced bok choy and green onions in airtight containers in your fridge. You can add a bit of water to help keep them crisp. Bring a cup of broth to a boil in the morning, turn off the heat and add a 1/4 cup of bok choy, a good sprinkle of green onions and 2-3 teaspoons of miso that has been mixed with a little water. Garnish to taste with tamari, vinegar and chillies. Optional to add a poached egg to your bowl or to make your miso into egg drop soup by cracking an egg into the broth just before the heat is turned off. Cost: $320, Early Bird Pricing $275 until February 10, 2017. Early March brings the beginning of transition from the place of deepest yin – inwardness, quietude and stillness - into the first stirrings of yang. We sense something coming to life and look for expression of this, both within and around us. In Five Element Theory this is the transition between the elements of Water and Wood. It is a time to bring the formless into form. This can be a challenging seasonal transition both physically and emotionally. It is also, however, an opportunity for us to bring forth emerging aspects of our essential nature. In our retreat we will be exploring practices and teachings that integrate eastern and naturopathic understandings of self-care and self-healing. In acknowledging our intrinsic connection to the earth and all of life, we develop an increased awareness of how our personal inner landscape is deeply connected to and affected by the seasonal landscape. With the arrival of Spring we will be focusing on emerging within ourselves with connection, direction and patience. Together we will explore alchemical Taoist teachings interwoven with naturopathic principles of health and well being as they relate to this season. And, through the practices of yin yoga, meditation and personal inquiry, we will create a potent container for self-healing and transformation. To register, please contact: office@drkristinschnurr.com or carlyforestyoga@gmail.com. Long and lovely parsnips sit unassuming on the shelves of the grocery store (or better still, damp with earth from the farmer's fields late in the harvest season). We walk by them, not quite sure what to do with them, surely their coloured cousins the carrots must be more nutritious? While it is true that carrots are higher in most of the vitamin family, parsnips are rich with minerals (including a healthy dose of magnesium, which is one of our favourite minerals to talk about around these parts) as well as dietary fibre. And the vitamins that parsnips have are nothing to dismiss either. They have sizeable measures of Vitamin A, B, C, & E as well as folic acid and thiamin. Looking for the balance between sweet and salty, nourishing and comforting we often believe that these things function in opposition to each other. We believe we must choose between one or the other - will we indulge this evening or will we contain ourselves to following the rules? The beauty of parsnips is that you don't need to find any middle ground. They are both sweet and nourishing, they are the perfect medium for a savoury dinner and they are by all definitions comforting. They satiate an in between place in our bodies and our souls at the same time. Unfamiliar at first, the humble parsnip will easily find it's way into your regular routine. It becomes a natural companion to potatoes, carrots, beets, turnips. You will forget that there was ever a time you wondered what exactly a parsnip was. If you're in doubt make this soup. It will take you half an hour to prep and another half hour to cook. Put it on early and make time to nourish your mind with a book or a walk while it simmers quietly on your stove. Heat the olive oil or butter in a large soup pot over medium heat. Add the onion and 1/2 teaspoon of the salt and sauté for 5 - 7 minutes or until soft. Add the celery root, parsnip, pears, garlic, thyme, stock and wine/apple cider vinegar. Cover and simmer for 30 minutes or until all vegetables are soft and ready to puree. Blend using an immersion blender in the pot, or let cool slightly and transfer the soup to a stand blender to puree. As we move into the damp and darker weather that this time of year brings our bodies crave a different kind of nutrition. We crave warming and supportive foods that nourish our souls as well as our bodies. We fight the shortening of daylight at the same time that we fight the common cold and the flu. To satisfy these primal cravings and fortify ourselves for what is to come we have brewed bone broth for centuries. Filled to the brim with protein, collagen, vitamins, minerals and amino acids, bone broth has been a staple in almost all traditional cuisines around the world. In our culture the simmering pot on Grandma's stove is a symbol of love and healing. One of the most easily absorbed foods bone both is also extremely hydrating, making it perhaps the most perfect winter superfood. Place roasted chicken bones in a medium/large pot and add water, vinegar and vegetables. Lower the heat and simmer your stock for 8 hours. When it is done the bones should be soft and break in half easily. Strain out the veggies and chicken bones. Let cool in the fridge. This allows the fat to rise to the top, which can then easily be skimmed off before using or putting into the freezer for longer storage. Use within one week of refrigeration or six months of freezing. As the days get shorter and we spend less time outside in the sunshine, it is time to think about optimizing our Vitamin D levels again. Vitamin D plays an important role in immune function, energy levels, mental health, mineral absorption and in prevention of chronic inflammatory conditions such as: heart disease, cancer, diabetes, osteoporosis and autoimmune conditions. Regular sun exposure, without sunscreen, causes your skin to produce Vitamin D naturally. But, not all sun exposure produces Vitamin D. The angle of the sun to the earth must be greater than 45 degrees. If it is lower, the UV rays are filtered out and do not make it to the surface of your skin. In Victoria, only sun exposure between 10am and 3pm during the months of April-September will result in Vitamin D production. Through the fall and winter, it may be necessary to supplement with oral Vitamin D.
Recent research shows that it is important to be taking Vitamin D with Vitamin K2. If you have a personal or family history of any of the above conditions, please ensure you are taking Vitamin D3 with Vitamin K2 in an ideal ratio . Vitamin K2 ensures that Calcium and Vitamin D make it to our bones and teeth rather than our arteries. A large epidemiological study from the Netherlands measured the extent of heart disease and how this is related to Vitamin K2 intake and arterial calcification. They found that calcification of the arteries was the best predictor of heart disease. Those in the highest third of vitamin K2 intakes were 52 percent less likely to develop severe calcification of the arteries, 41 percent less likely to develop heart disease, and 57 percent less likely to die from it. Vitamin D levels can be measured with a simple blood test: Serum 25-Hydroxy Vitamin D. Optimal levels should be between 125-150nmol/L. The ideal ratio of Vitamin D3 to K2 for most people is 10:1, ie. Vit D3 - 1000IU/Vit K2 - 100mcg. This weekend retreat is offered as an interlude and an invitation: to learn about the qualities, elemental nature and energetic imprint of the season and how you can honour and tend to these same facets within yourself. Learning to relate to and navigate your own inner winter is especially potent in a season that is known for its mental, physical, and emotional hardship. Near the end of November, our corner of the earth has turned her cheek almost entirely away from the sun. There is more darkness, more stillness. It is a season ruled by Yin. In Five Element theory, this is a transition time between the metal and water elements; a time that encourages us to rest, make contact with our own deepest waters, and cultivate receptivity. This weekend retreat is offered as an interlude and an invitation: to learn about the qualities, elemental nature and energetic imprint of the season and how you can honour and tend to these same facets within yourself. Learning how to relate to and navigate your own inner winter is especially potent in a season that is known for its mental, physical, and emotional hardship. Through an integrated approach that combines eastern philosophy, naturopathic principles, the science and spirit of self-healing, and embodied practices, we explore ways to deepen our seasonal attunement to create vital health and wellbeing. You will gain insight and tools to help you navigate the emotional terrain of the season and ritualize self-care. You will learn how to best care for your physical body so that you can fully house your spirit. And you will be reminded of your innate ability to heal. Join us in the conversations, self-inquiry and deeping embodied yin yoga practices that will help us meet this time of year wholeheartedly. The thing I love most about this recipe, other than it only having 7 ingredients, is that you can make these scrumptious treats in any flavour of your choosing. As I mentioned above, its berry season so I'm thinking cherry, blueberry and strawberry! Instead of turning on the oven in this summer heat, you just pop them in the freezer to set. Taste and adjust seasonings as needed. If adding peanut butter, add to the blender and mix until thoroughly combined. If flavoring with berries or caramel, wait and swirl on top of plain cheesecakes (optional). Once set, remove by tugging on the tabs or loosening them with a butter knife. They should pop right out. Our favorite way to devour these was with a little more and a touch of coconut whipped cream. But they're perfect as is! Keep in the freezer for up to 1-2 weeks. *If your dates are not sticky and moist, you can soak them in warm water for 10 minutes, then drain. But be sure to drain thoroughly and pat dry to prevent the crust from getting soggy. *To quick soak cashews, pour boiling hot water over the cashews, soak for 1 hour uncovered, then drain and use as instructed. This delicious Asian flavoured salad can be made into a meal by adding some grilled salmon or any other protein that suits your taste buds. We feel so fortunate to still be pulling carrots and beets from the ground. And this salad is perfect for spring! A delicious and colorful salad to kick start your liver as we enter the season of the Wood element. Place the lettuce into a large salad bowl and top with the grated beets, carrots, and cilantro. To make the dressing add all ingredients to your blender and blend until smooth and creamy. the dressing will be a slight pink color. Dressing can be kept in a glass jar in the fridge for up to a week. Preheat the oven to 350F. Lightly grease a large rectangular baking dish (approx. 8.5" x 12.5") and line with a piece of parchment paper so the bars are easier to lift out. Approximate nutritional info: (per bar, based on 14 large bars using 1/2 cup dried sweetened cherries): 186 calories, 8.7 grams fat, 22 grams carbs, 4.7 grams fibre, 6 grams sugar, 6.6 grams protein. Without dried cherries, bars have approx. 3.6 grams of sugar and 166 calories. Tips: To wrap these up for freezing, I wrapped the bars individually in parchment paper using 6-inch by 12-inch pieces of parchment. After wrapping up a bar, tie it with string or tape it to secure. Finally, place all of the bars into a freezer-safe zip lock bag, press out all the air, and then seal it shut. I will update this note when I know how long the bars last for, but I expect they will keep for over 1 month in the freezer. 2) These bars aren't super sweet, so if you prefer something sweeter you can always add a touch of sweetener. 3) I also expect these would be great with chopped dark chocolate added in! Insulin Resistance: What it is and what you can do about it. Insulin is the hormone whose main function is to process sugar in the bloodstream and carry it to fat, liver, and muscle cells to be stored for later use. When your body is flooded with too much insulin too much of the time, your cells can become resistant, or desensitized, to its effects. Insulin resistance over the long term will result in Metabolic Dysfunction. The most common cause is the consumption of too much nutrient-poor carbohydrate. Other causes include: the use of artificial sweeteners, an insufficient protein intake, chronic stress, erratic or irregular mealtimes, over-exercising or lack of exercise, poor liver function, excess alcohol consumption or an existing hormonal imbalance – ie. excess cortisol or estrogen. Short-term side effects of high insulin include heart palpitations, sweating, poor concentration, weakness, anxiety, fogginess, fatigue, irritability, increased hunger and sugar cravings. Over the long term, signs of excess insulin include a tendency to hold extra weight abdominally, around your hips or over your triceps; an inability to lose weight in spite of a healthy diet and regular exercise; water retention or a puffiness in the face and extremities, fatigue, burning feet at night, skin tags, infertility or irregular menses, erectile dysfunction, gout, vision changes or sleep disruption. Beyond obesity and type 2 diabetes, metabolic syndrome is associated with an increased risk of heart disease, stroke, cancer, Alzheimer’s disease, reproductive abnormalities, androgen imbalance in women and osteoporosis. The following are the most important steps you can take to improve insulin receptor sensitivity and restore optimal metabolic function. 1) Limit your sugar intake – Sugar in the form of high dose fructose impairs insulin sensitivity more than any other food. Examples of high dose fructose foods are: cakes, candy, fruit juice, dried fruit, agave, honey, sweetened milks. Whole fresh fruit okay to eat as it is considered a low dose fructose, which actually improves insulin sensitivity. The American Health Association recommends a maximum daily intake of sugar for women of 25g, and for men 37.5g. Most people eat close to 100g/day, so making this adjustment can make a huge difference. 2) Increase your muscle mass – The more muscle you have the more sensitive it will be to insulin. With just 3 weeks of strength exercises for 30 minutes 3 times/week, you can increase your insulin sensitivity by 24%. 3) Improve your stress response – Chronically elevated cortisol gives your body the message to increase abdominal fat storage and further depresses your metabolic rate by increasing muscle breakdown. Developing good self care that effectively lowers your cortisol levels and keeps you out of a regular ‘fight or flight’ response is essential. Some examples include: meditation, yoga, dancing, laughing with friends or walking in nature. 4) Sleep – Chronic insomnia is a major cause of insulin resistance. Four consecutive nights of poor sleep (less than 5 hours) is enough to reduce insulin sensitivity by 30 percent. 5) Supplement Magnesium – Magnesium deficiency can cause insulin resistance. A magnesium rich diet improves insulin sensitivity so well it can be used instead of Metformin – the insulin-sensitizing drug prescribed for pre-diabetes and PCOS. Magnesium rich foods include: green leafy vegetables, nuts and seeds and legumes. Stress and exercise deplete magnesium levels, so supplementation is often indicated. Magnesium glycinate is the best form of magnesium – usually 300-400mg/day taken with food. Insulin Resistance is unfortunately increasingly common, affecting one in four adults. It is often the basis of other hormonal imbalances and it must be addressed in order for other imbalances to resolve and for optimal wellbeing. Basciano, H, Federico, L., Adeli, K. (2005), Fructose, insulin resistance, and metabolic dyslipidemia. Nutritional Metabolism. Feb 21;2(1):5.. Location: The Yurt on Old West Saanich Rd. Join us for a weekend of practice, inspiration and inquiry as we explore the possibility for healing and increased self awareness in our daily lives. In mid February we will be in the midst of the transition from the place of deepest yin – inwardness, quietude and stillness, into the first stirrings of yang. We sense something coming to life and looking for expression, both within us and around us. It is time to bring the formless into form. This can be a challenging seasonal transition both physically and emotionally. It is also an opportunity for us to bring forth emerging aspects of our essential nature. In our retreat we will be exploring practices and teachings that integrate eastern and western understandings of self care and self healing. In acknowledging our intrinsic connection to the earth and all of life, we develop an increased awareness of how our personal inner landscape is deeply connected to and affected by the seasonal landscape. Together we will explore alchemical Taoist teachings interwoven with naturopathic principles of health and well being as they relate to this season. And, through the practices of yin yoga, meditation and personal inquiry, we will create a potent container for self healing and transformation. With the cold and flu season upon us, here are a few tips to keep ourselves and our families healthy. Rest. Head to bed early, and aim for extra sleep (more than 7-8 hours) if you are feeling those niggly first signs of sickness. Fresh air. Bundle up and head outdoors for a hike, boost your Vitamin D levels naturally to enhance your immune function. Eat nutrient rich foods. Enjoy a wide variety of foods rich in vitamins, mineral and antioxidants to fortify your bodies defenses. Focus on warm, cooked foods such as soups and stews. Think about lots of vegetables and protein. Limit sugar as it suppresses your immune function. Manage your allergies. Awareness and avoidance of allergens reduces the burden on your immune system for optimal functioning. In terms of supplementation, as a preventative strategy through this season I recommend extra daily Vitamin C and D, and increased Probiotics. · Echinacea Tincture (the best Echinacea I have ever used) ½ dropper 5 times/day at the first sign of symptoms of immune activation, for me this could be feeling suddenly cold or achy, or noticing a slight scratchy throat. Kids can take this too in a glycerite form if they won’t do the tincture. · Honey Garlic syrup – for sore throats it works so well it seems like a magical cure. The recipe can be found on our clinic blog. · If there is a fever, UNDA 2, 5, 15 to encourage the fever and support our innate immune response. This is a staple in our house through the winter months…works super well! 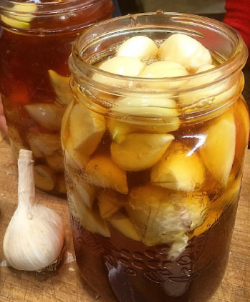 Fill a mason jar with peeled garlic about 1/2 way - we use our own organically grown garlic. Fill the rest of the jar with unpasteurized local honey. Let it sit in a cool dark cupboard for 4 weeks. Strain. And done! Yay! Soup season has arrived. I like to make large batches and freeze extra portions in mason jars. I am also very much into soups that are blended so that chopping with a little person on my hip is minimal. This one is delicious. Heat oil in a medium pot. Add the onion, garlic a few pinches of salt and pepper, and cook until the onion is translucent. Add the paprika and cook until fragrant (30 seconds or so). Add a good splash of balsamic vinegar and stir. Add the tomatoes and thyme leaves. Stir, then add the chickpeas, coconut milk and water. Cover and gently simmer for 20-30 minutes. Uncover and let cool slightly. Note: This soup tastes even better the next day so it is a great one to make in advance. Autumn has found her way up the peninsula to Little Bird Farm. Days are shorter, and nights are cooler and everything is a little bit more golden. It is harvest time, apples and pears have been picked, garlic has been dried and we are getting ready to plant next years crop. You will soon see butternut squash and pumpkins at the farmstand. And, if you peek into the field, there is a bright row of sunflowers, as tall as trees, bringing happiness to even the greyest of days. Magnesium lowers blood sugar – Magnesium effectively sensitizes insulin receptors resulting in improved control of insulin and fewer sugar cravings. Magnesium regulates cortisol levels – Magnesium relaxes the nervous system and reduces excess cortisol production. It also prevents uptake of cortisol into the brain. Magnesium supports quality sleep – Magnesium calms the brain by blocking the binding of a stimulating neurotransmitter (Glutamate) to NDMA receptors. Optimal sleep is crucial to hormonal balance. Magnesium supports optimal thyroid function – Magnesium is essential for thyroid hormone production. Most cases of thyroid imbalance are autoimmune in origin, Magnesium helps to decrease the underlying inflammation which causes the autoimmune response. Magnesium is anti-aging – Magnesium is essential to the production of steroid hormones such as Testosterone, DHEA, Progesterone and Estrogen. It has been shown to enhance glutathione production, prevent telomere shortening and reduce oxidative stress – slowing down the aging process. Because most of your magnesium is inside your cells, it does not test well with standard laboratory testing. As most people are deficient I usually recommend trying a low dose and seeing how you feel. I most often recommend magnesium glycinate or bis-glycinate. This form of magnesium has an affinity for nervous tissue, is highly absorbable and is very well tolerated. It has the least laxative effect of all forms of magnesium. Food sources of magnesium include leafy greens, almonds, sesame and sunflower seeds, and chocolate. Correcting a magnesium deficiency will often reduce or completely eliminate chocolate cravings. Soak one piece of rice paper in warm water until softening and pattern in paper is less noticeable. Pull out of water carefully, allow excess water to drain, and lay out on flat damp dishtowel. Arrange veggies in a row along centre of rice paper. Add noodles first if using and greens last. Leave about 1 1/2 inches at each end. Fold in edges of one end to meet the veggies and than wrap up sides. Place second piece of rice paper in water to soften. Pull out of water carefully, allow excess water to drain, and lay out on flat surface. Repeat. Other tips - you can use any assortment of veggies- raw, steamed, baked roasted. Will keep in a stored container in the fridge for up to five days. I truly appreciate a perfectly brewed, artfully crafted organic espresso – these days this happens about once every couple of months. I love the taste of coffee and the relaxing ritual of lingering over a matcha hemp milk latte while engrossed in thought-provoking conversation or some interesting reading material. I can understand the appeal of this as a daily ritual. While I have never had a daily attachment to caffeine in general, during the first year of my daughter’s life when sleep was at a premium, I gave serious thought to developing one. Working with hormonal balance, I often advise people to decrease or come off coffee or caffeine completely. For some people, this is incredibly challenging, and it is difficult to understand how even one cup/day, for some people can be an issue. Caffeine is an addictive CNS stimulant. It works by blocking adenosine receptors in the brain. Adenosine is a neuromodulator, which inhibits the release of neurotransmitters. When the receptors are blocked by caffeine, there is increase in central nervous system stimulation. To take this one step further, the binding of caffeine to the adenosine receptors means that instead of slowing down, the brain/nerve cells fire up. The pituitary notices this increased action and sends hormones to tell the adrenal glands to increase production of adrenaline, activating a fight or flight energy. At the same time, caffeine slows down the reabsorption of dopamine, which is our pleasure neurotransmitter. With extra dopamine, you not only feel alert, but you feel really good. Until, these levels drop, usually about 5 hours after ingestion. No wonder it is hard to give up. It is a challenge in terms of hormonal balance, because with daily coffee use, your body becomes used to this cycle, cortisol and dopamine levels are pushed beyond their natural limits of production and this is not sustainable, your nervous system becomes chronically stimulated, magnesium levels are depleted, and you are likely chronically dehydrated. Giving your body a break from this cycle allows for an opportunity to restore adrenal and hormonal health, balance your brain chemistry, improve your liver function and achieve mood stability. After the first few days, most people report stable more consistent energy levels. Our first crop at Little Bird Farm went in the ground last weekend. It was a beautiful day for planting four varieties of garlic (Allium sativum) and we had lots of help. Thyroid disorders are prevalent in our culture, and are unfortunately often poorly managed within the conventional system. I find myself explaining thyroid function and assessment on a daily basis. It is a complex topic and requires a significant amount of time to cover thoroughly during a consultation. I am hopeful this article will serve as a reference for those of you working with an imbalanced thyroid. While symptoms are more important to me than lab values, in the case of thyroid disorders the following tests make my job easier. And, thorough testing usually means that you begin to feel better faster because we are able to support you as specifically and efficiently as possible. TSH (Thyroid stimulating hormone) - is the hormone released by your pituitary gland to stimulate your thyroid to produce thyroid hormone. Within the conventional system, this is the current test used in diagnosis of a thyroid disorder. The “official” normal range for adults is quite broad – 0.5-5.0. This range remains despite the fact that the AACE (American Association of Clinical Endocrinologists) announced in 2002 that the range of TSH should be narrowed to 0.3-3.0. The goal of this recommendation was to enable physicians to diagnose and treat thyroid disease early, before it can lead to more serious conditions such as hypercholesterolemia, heart disease, osteoporosis, infertility and depression. Unfortunately, every week I have people coming into my office with symptoms of hypothyroidism (fatigue, weight gain, difficult focus, hair loss, depression…) in whom a thyroid disorder has been ruled out because TSH was within the normal range. Free T4 (Thyroxine) - is the main thyroid hormone produced by the thyroid gland. I refer to it as a pre-hormone because it is only about 10% metabolically active even though it represents roughly 90% of circulating thyroid hormone. The "free" part means we are measuring the quantity of hormone not bound to other proteins in the blood. When T4 levels are adequate, your pituitary gland receives the message that enough TSH is being produced. This means that TSH can be normal, even when your body is not converting T4 to T3. Free T3 (Triiodothyronine) - represents our body's most active thyroid hormone. The T4 in circulation is converted within our liver and kidney into T3. T3 stimulates cellular metabolism. T3 represents only about 10% of circulating thyroid hormone but is about 90% active. Again, we want to make sure we measure the free levels of this hormone to properly assess what is available to our cells. Thyroid antibodies (TPO, ATA, TSI) - These antibodies play a critical role in many thyroid conditions. Eighty percent of women that have hypothyroidism have it due to an autoimmune condition referred to as Hashimoto's Disease. The TPO (thyroid peroxidase antibodies) and the ATA (anti-thyroglobulin antibodies) are two critical markers present when an autoimmune process is at play. The TSI antibody is related to an autoimmune hyperthyroid state called Graves' disease. Within the conventional system these tests are often overlooked, even in people with a longstanding thyroid condition. From a conventional perspective, the treatment of an autoimmune thyroid condition is essentially the same as a non-autoimmune thyroid condition. Naturopathically, we will work to resolve the autoimmune condition, so, knowing whether it is underlying a thyroid imbalance is very important. Reverse T3 - If cortisol levels are high, your body can convert the T4 hormone into reverse T3 instead of regular T3. The reverse T3 will bind to the T3 receptor site but will not activate it. In the process, reverse T3 blocks these receptor sites from regular T3 and the net effect is your body having less T3 stimulation and reduced metabolism. This is an attempt by our body to preserve energy levels in times of stress. If this level is high, it can indicate that an adrenal imbalance is underlying your thyroid disorder. Thyroid issues rarely exist in isolation. Underlying conditions that may be related include: imbalances within the adrenal or reproductive system, food sensitivities (often gluten enteropathy), and vitamin/ mineral deficiencies. Further testing may be recommended depending on other relevant symptoms.